Futura Automation LLC is pleased to announce the introduction of “Power Palletizer”, a state of the art, BLDC servo-driven Cartesian style robot palletizing system. Macron Dynamics provides the mechanical components, Delta Technology in Phoenix provides fabrication and field support while Vanguard Automation in Denver, NC provides the electrics, safety and controls. 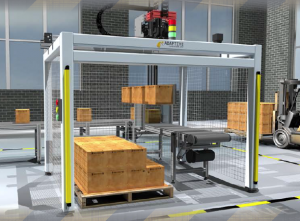 This new palletizing system can be combined with standard or custom EOL strapping and/or wrapping systems to complete the packaging of any type of product at cutting edge speed.